We are really lucky to have great gems on our team. Lauretta is no exception. Her love and compassion for animals is pretty amazing. She is involved in numerous animal rescue organizations. Like Marcy, Lauretta serves on the board of SNIP (Spay Neuter Idaho Pets, Inc.). Lauretta also works with Canine Companions for Independence, a service dog organization, Bully Breed rescue, and other organizations. Lauretta is upbeat and positive, and has a compassionate heart. Lauretta’s first pet was a boxer named Shotzy. She also had a cat named George. She has fond memories of these two pets. She has had numerous other pets over the years, but it currently pet-less. That’s OK though, her job at The Pet Sitter of Boise gives her lots of love from the pets she cares for. Besides pets, Lauretta has many outside interests. She used to own her own plane and had a pilot’s license! She also loves camping. Lauretta is a happy, social person with many interests. 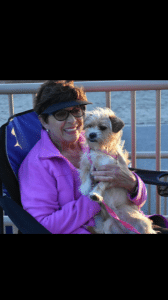 Lauretta likes being part of The Pet Sitter team because she gets lots of loves from the pets and gives the owners peace of mind while they are away. Lauretta serves SE Boise, Downtown Boise, Boise’s Bench, and Boise’s North End.